So, on January 10, I was told by my cohort who was in charge of designing and implementing the Leadership Summit that – not so much that I wasn’t able to present on Spirituality and Leadership, as it was (no joke) inappropriate that I present on this due to my position. That it could be seen as questionable that I would want to present on this, because if – and seriously, I can’t make this crap up – I presented myself as being of one religious persuasion, it might make some of the students I work with uncomfortable and they would not seek me out as a campus resource as much. So, I was told that not only would I have to scrap the presentation I had been researching, preparing and working on for three days and replace it with something else entirely new, but a local pastor had been contacted to present on spiritual leadership as it was far more appropriate for a minister to speak on such matters. It was made clear to me that it was “better” if I present on another topic – or topics – of my choosing that were more neutral in tone. That yes, the students who were working on the selecting and crafting of the day-long intensive series of workshops had indeed requested for a presenter to address the idea of spirituality and leadership, but that it just would not and could not be me. This, as the kids say, royally cheesed me off. Now, I do feel the need to drop a caveat here: I do not believe that this in any way reflected the choice or opinion of my cohort. I did not hold her in blame for this. Neither will I editorialize on what I perceived as the manner in which the information was delivered nor at the timing of it. I simply at this time knew that the work I’d been doing for three days – both in the office and at home – was officially now for naught. After getting REALLY angry (Ashley had yet to actually see me this upset before – I remember the afternoon of the 10th when I came home for lunch and first told her about this – oh, the pure venom that was just spewing out of my mouth at the time…), I decided to take the only approach I felt that I could outside of praying for some direct divine intervention: I decided to submit a second proposal, stating that I would present on both topics, but that I was not going to give up the chance to present on spirituality and leadership, and that I was exceptionally passionate about doing so. 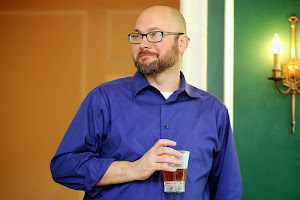 My argument was that it made absolutely no sense that it was perfectly acceptable and okay for me as a white, heterosexual male from the South coming from a middle-class income to be allowed and even encouraged to speak on topics of diversity – including socioeconomic and racial and ethnic differences – as well as on LGBT issues, but that it was presumptuous and incorrect to assume that only an ordained minister could speak on matters of spirituality. Now, the guy who was asked directly to present on CHRISTIAN leadership (which was his subject matter) at the Leadership Summit is a really cool guy and I respect him loads, and I was crystal clear that while his presentation was focused at a specific target audience – namely, Christians – mine was a little more broad in its scope…although it would be filtered through the lens of a Christ follower. And...they agreed to let me speak. On both. I honestly think it was only the fact that I cried foul and even discrimination that allowed me to actually follow through with being able to present on spirituality…which is pretty stinking sad, if you stop to think about it. However, it’s also a little bit of a testament of the times we live in that THAT was what made it okay for me to actually speak about something I was passionate about, and to be able to – as the pastor at Mosaic Miami has said – leverage my position for the Kingdom. What did give this entire situation one moment of beauty was the fact that we were told in advance to prepare only about 20-25 copies of our presentations for handouts, because – really – not that many people would be interested in seeing or hearing about the topic. I wound up making 40 copies of the handouts of BOTH my presentations (the other being “Confessions of a Reluctant Leader: How To Lead Courageously Even When You Don’t Want To”), because I knew that other people who weren’t attending the Leadership Summit had asked me for copies of my presentations. 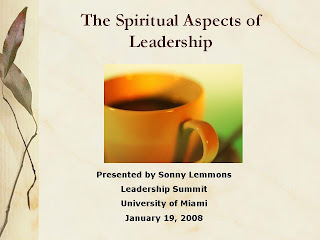 On Saturday, January 19, 2008, I held both my sessions back-to-back that afternoon in a classroom that held 60 people. Both sessions were packed to capacity. I ran out of handouts and business cards, and my session on “Spirituality and Leadership” wound up being one of the highest-rated sessions at the Summit in terms of evaluations by the students who attended. 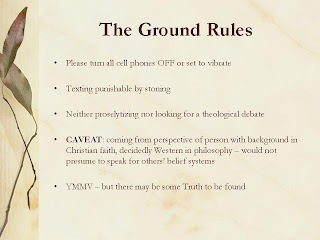 I don’t state the above to brag on myself in any way, to thumb my nose at those who poo-pooed my idea of presenting on spirituality, nor to say “I win.” I mention it just to point out that – yes, there was and still apparently is a hunger and desire to understand things through heaven’s lens, and that God can move in powerful ways, especially when people try to stop him. And anyone who’d like a free copy of my session – all ya gotta do is email me and ask, and I’ll send you an electronic copy for free.